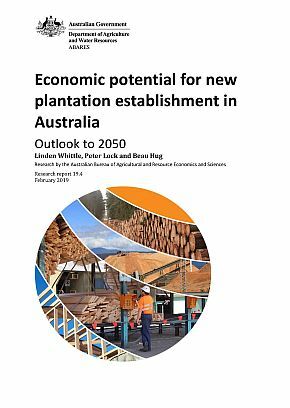 The Economic potential for new plantation establishment in Australia: outlook to 2050 report is based on a joint work program between Forest and Wood Products Australia (FWPA) and the Australian Bureau of Agricultural and Resource Economics and Sciences (ABARES). Ric Sinclair, Managing Director of FWPA, said: “There is a lot of interest in using timber products for taller buildings, as well as the traditional detached house market. The new ABARES report reveals that Australia needs to significantly increase the amount of softwood plantations over the coming decades if we want to meet this demand domestically. In 2015–16 commercial timber plantations, which were split virtually evenly between softwood and hardwood species, accounted for 87 per cent of Australia’s log production. ABARES forecasts a shortfall in the volume of softwood sawlogs available for the domestic market of 2.6 million cubic metres. In terms of new softwood plantations, an additional 200,000 to 250,000 hectares would be required by 2050 to make up the shortfall. However, given the uncertainty around softwood sawlog supply and log-equivalent demand in 2050, some estimates suggest the required area could be higher with Omega Consulting indicating that this could be as much as 490,000 hectares. In order to meet growing demand, the domestic market will become increasingly reliant on imports of sawnwood. ABARES estimates the volume of imports will more than double by 2050. This is a potential missed opportunity for the Australian forestry sector, unless the current softwood timber plantation estate expands to meet growing demand. The report also modelled five different scenarios to see which market mechanisms could have the most impact on plantation expansion. These included: productivity improvements, changes in agricultural land prices, increases in demand, changes in exchange rates and reductions in the required rate of return (discount rate). Interestingly, while all the scenarios supported the need for an expansion of the softwood estate, changes in the discount rate had the greatest impact because softwood plantations managed for sawlogs have much longer rotation lengths and therefore pay-off periods. For instance, a 1 per cent reduction in the discount rate to 6 per cent would encourage a further 264,520 hectares of softwood plantation development. In addition, a 5 per cent discount rate could see the softwood estate expand by some 700,000 hectares. Mr Sinclair said the report has identified potential for the forestry industry to grow and potential policy levers to make this happen. “As the old proverb says, the best time to plant trees was yesterday and the second best is to plant them now. Commercial plantations can provide economic, social and environmental benefits for Australia and we need to get back onto a growth path as soon as possible,” he said.